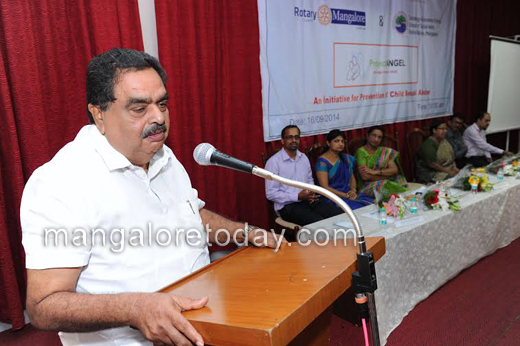 Mangalore, Sep 18, 2014: Launching the initiative, Minister for Forests, ecology and environment B Ramanath Rai said the incidents of child sexual abuse is a shame on the society. Inchara Foundation in association with Rotary Mangalore and other like minded organisations launched a new initiative, ‘Project Angel’ to promote awareness and prevention against violation of Child Rights, with special emphasis on child sexual abuse. “Children are like God. Why do we lose our sensitivity?” he asked. “The increasing cases of child sexual abuse indicate that we have lost our sensitivity. All the citizens have a collective responsibility to build a healthy society.” Roshni Nilaya School of Social Work MSW department Dean Prof Ramila Shekhar said that many a time sexual abuses on children did not come to light. Unfortunately, the victims of such abuse often do not even know what sexual abuse is. Stating that preventive programme is the need of the hour, she said that schools must allow open discussion on sexual abuse and the awareness on the abuse should be started right from Kindergarten. The tiny tots should be taught to distinguish between good touch and bad touch. 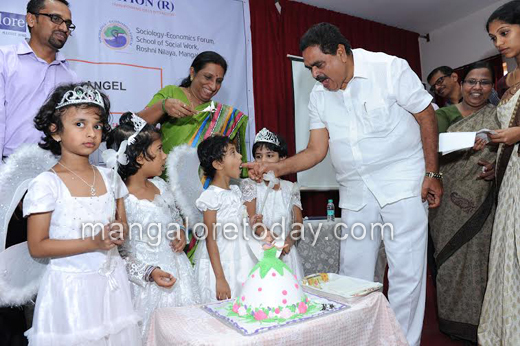 Minister for Forests, Ecology and Environment B Ramanath Rai launches the Project Angel, an initiative by Inchara Foundation and Rotary Club, to check child abuse, at Roshni Nilaya School of Social Work in Mangalore on Tuesday.